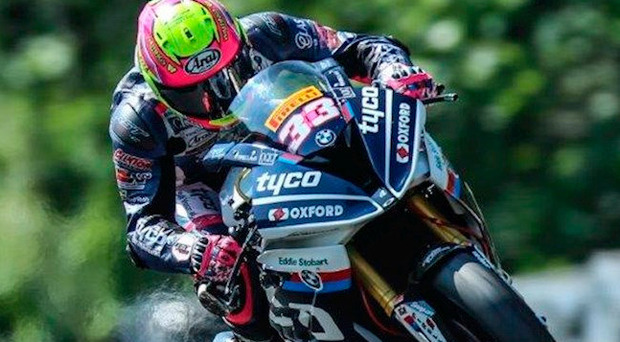 Keith Farmer lifted the gloom in the Tyco BMW camp at Oulton Park yesterday by winning the British Superstock 1000cc race and moving into second position in the Championship standings after a spirited ride. This was after the team's lone Superbike rider - Michael Laverty - had a nightmare. He qualified 21st, crashed out of race one on lap one, started from the back of the grid for race two and salvaged three Championship points for 13th position - not where he expects to be. Farmer, nursing an injured hand from a test-day spill, was on pole position for the Superstock 1000cc 15-lap race, but made a dismal start and had to fight his way back to challenge for the lead. Andy Reid took the holeshot but, in front on lap six, the EHA Aprilia suffered a mechanical issue and the tattoo artist was forced out. Farmer clawed his way back through the field to join Joe Collier and Chrissy Rouse in an intense battle for the win that ultimately went to the last lap. The Clogher Bullet made a decisive move for the lead and defended from a last-corner attack by Collier (EHA Aprilia) to secure his first win of 2018 and move into second place in the Championship, 11 points behind Billy McConnell, who finished fifth yesterday. Alastair Seeley was seventh in his final outing before the North West 200 and Josh Elliott 18th. Leon Haslam enjoyed double British Superbike success yesterday to move into the lead of the Championship on 115 points, 14 ahead of Bradley Rea, as Glenn Irwin could only manage a non-finish and a fifth position. Carrick ace Irwin said: "I'm disappointed, big time. After a good test here last week, potential was high and we felt sure we'd be challenging for podiums. "Running third in race one, I lost the front of the PBM Be Wiser Ducati at Island Bend and I'm mystified as to what happened. I wasn't even pushing at the time. "In race two, I rode like an onion, suffered arm pump from tension and finished what for me is a poor fifth. Some might say fifth isn't a bad result, but it's not where I should be." Irwin is still in the vital top six positions of the Championship and now heads for the North West where he made a significant contribution last year by winning the final Superbike race in a thriller. Dubliner Jack Kennedy dominated British Supersport by taking victory in the feature race yesterday to add to his Sprint victory on Sunday. That is now two seconds and four wins in a row for the Integro Yamaha rider, who said: "I topped everything this weekend, - practice, qualifying, the first race and now the longer second race, plus take a 14-point lead in the Championship. "I kept getting boards saying +0 every lap. Ben (Currie) had upped his pace and pushed me hard and it was only on the final lap when I nipped past a slower rider that gave me the race-winning gap." Ian Hutchinson made a race-winning comeback on his Honda Fireblade at an EMRA Club meeting at Mallory Park over the weekend, as he attempts to make an international return to the North West 200 and TT after a serious leg break sustained during last year's Senior TT.